And I feel they stand out in a monochrome picture. Lines are pleasing to the eye symbolizing for me perfection, and the beauty therein. I seem to punctuate my reading spells every now and then with a good Young Adult genre that seem to awaken some leftover “YA emotions” hibernating in some corner of me and I time-travel. Interesting exercise that this is – to look back at one’s vulnerable time as a YA, now ensconced in the acquired wisdom (more or less) in a dear exchange of youth, hope and careless optimism – is to see life come a full circle. The Book: is a first-person narrative by the highschooler protagonist Aza who keeps getting into an obsessive hypochondriacal cycle of over-thinking going down into an infinite and ever-tightening spiral, a condition she is very well aware of, but unable to extricate herself from. In other words, this book is primarily about how it feels to be trapped in mind of a mentally ill person. Yet, just like touching someone else’s body isn’t the same as having someone else’s body, reading about mental illness may not be even close to actually experiencing it, though it behooves us to educate ourselves and empathize. Other characters in the story are Aza’s mother, her friend Mychal, almost-boyfriend Davis and the psychotherapist, Dr. Singh. But the character I most enjoyed was Aza’s longtime best friend Daisy – a Star Wars fan fiction writer coming from a very modest family background with tons of practical wisdom, quick wit and humor that I loved! Having explained the Big Bang and how the earth and life came into being, the scientist asks his audience if they had any questions, and an old lady raises her hand and says, ‘That’s all fine and good, Mr. Scientist, but the truth is, the earth is a flat plane resting on the back of a giant turtle.’ The scientist decides to have a bit of fun with the woman and responds, ‘Well, but if that’s so, what is the giant turtle standing upon?’ And the woman says, ‘It is standing upon the shell of another giant turtle.’ And now the scientist is frustrated, and he says, ‘Well, then what is that turtle standing upon?’ And the old woman says, ‘Sir, you don’t understand. It’s turtles all the way down.’ Thats how the book gets its curious title, and aptly so because, in my opinion, this alludes to the eternal question that has haunted the thinking man: Who am I? The philosophical conversations between Aza and Davis are intertwined with inspiring literary quotes. The climax of the book is not that Aza gets cured of her affliction and lives happily ever after; it is, instead, very realistic and makes you shed tears, it also hopeful believable and very beautiful. As I turned the pages to Acknowledgements, I was touched to find these last few lines, “It can be a long and difficult road, but mental illness is treatable. There is hope, even when your brain tells you there isn’t” and a treatment referral helpline for SAMSHA 1-877-SAMSHA7. 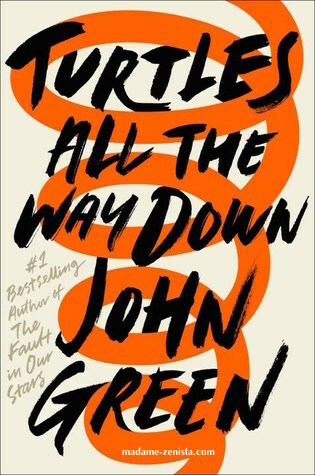 John Green’s writing is, as always, very engaging, clever and is in an honest voice. I give this book 4 stars on Goodreads. Awakening: the sleeping now awaken. I love it as Spring brings to life the hibernating trees and far away birds. The sun and rains, the chirping of birds, flowers hither and yon: the black and white canvas now colored with life! Oh- how I missed it all! Quote 2: She needed a hero, So that’s what she became.. The sun rises and sets every day, only to be back without fail – a promise that was never broken. Yet one can’t fail to be amazed by the spectacular show that is not the same…. The sunrise just coming out after fresh showers with all its splendor ! Sunset and me: the sun is going down into the depths of the ocean where it would refresh itself to be back again! Not touched up even though it might appear to, this picture reminds me of the evening when the sky went ablaze darkening further the shadows. I was enveloped in a peach-orange-pink-ish bubble away from this world. It was magical!